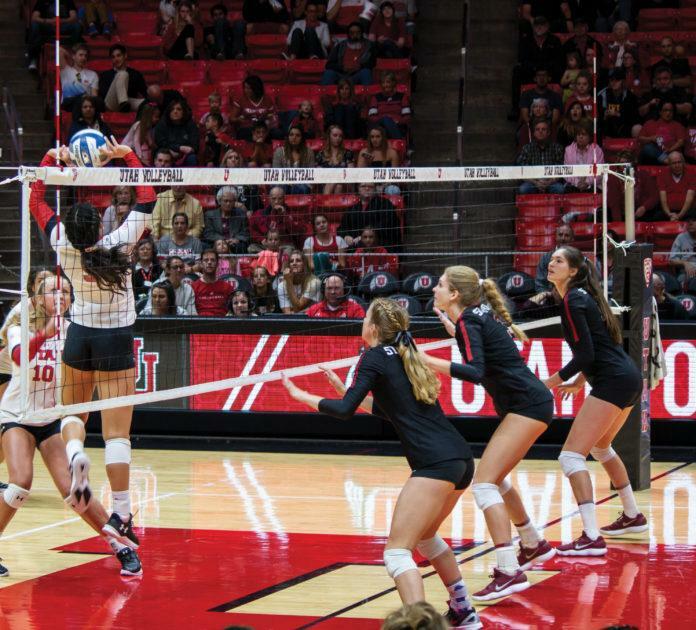 This past weekend, the University of Utah volleyball team hosted two Pac-12 matches up against No. 2 Stanford Friday night and University of California, Berkeley Sunday afternoon. The Utes fell 3-1 against No. 2 Stanford. They started off strong in the first set, with points going back and forth between the two teams. Stanford didn’t let it go for long and went on a 7-1 run to take a six-point lead that brought them to 18-12. The Utes responded quickly with a 5-0 run. Utah ended up spoiling one set point for Stanford and Stanford spoiled one for the Utes as well. After going back and forth, Stanford ended up taking the set 28-26. The Utes started off powerful in the second set with a 6-1 run to go 16-13. Stanford came back and took the lead at 23-21. The Utes kept up their confidence and took the next four points, leading them to take the second set 25-23. Taking the momentum early in the third set, Stanford kept it up in the next two sets, taking the third at 25-19 and the fourth 25-17, leading them to take the win Friday night with a 3-1 match. During the Stanford game, there were three girls that finished with double-digit digs including 18 by libero Brianna Doehrmann, 15 by setter Bailey Choy and 10 by outside hitter Megan Yett. On Sunday afternoon, the Utes had another upsetting loss, this time against the Cal Bears in a five-set match. Some Utah freshman had great overall performances Sunday afternoon, including outside hitter Megan Yett, who led the team with 14 kills as well as 13 digs. Also, middle blocker Kennedi Evans ended with the second most blocks in school history with 15. The Cal Bears started off strong in the first set, taking the win 25-23. The Utes made sure to respond quickly and they did take the second set 25-23 and the third 25-9. The Utes held the lead in the fourth set until Cal caught up 21-20. With the Utes losing their momentum later in the set, the Bears took the win 25-23. The Cal Bears started off the 5th set with a 7-0 run. The Utes had a hard time catching up to the Bears and the Cal Bears finished off taking the match in four 3-2. The Utes will continue to play at the Huntsman Center this coming weekend against Oregon State on Thursday, Oct. 11 and No. 20 Oregon on Sunday, Oct. 14 at noon.